Haiti still reels from the devastating effects of the January 12, 2010 earthquake that killed up to 300,000 people, rendered one in seven Haitians homeless, and wreaked $9 billion of damage in a country whose 2009 GDP was only $7 billion. The United States recognized the enormity of the crisis and granted Temporary Protected Status to eligible Haitians. Excluded from protection are individuals with certain criminal convictions (one felony or two misdemeanors). Over the past five years, the United States has forcibly returned approximately 1,500 men and women, including those with only minor criminal records, mothers and fathers of U.S. citizen children, people with severe medical and mental health conditions, and others. The result has been utterly devastating to deportees in Haiti and the families they leave behind in the United States. 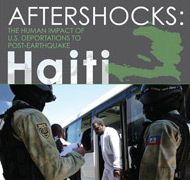 This report documents the stories of the men and women who have been deported from the United States to post-earthquake Haiti on account of a criminal history. Based upon extensive fieldwork and research, this report details the experiences of deportees—who sometimes refer to themselves as “strangers in a strange land”—and their U.S.-based family members. The report argues that the United States violates the fundamental human rights of Haitian nationals and their family members when it deports them to post-earthquake Haiti without due consideration of the deportees’ individual circumstances and the ongoing humanitarian crisis in Haiti. Haitian-American author Edwidge Danticat wrote the foreword to the report. Ms. Danticat is the award-winning author of such works as The Dew Breaker, Brother, I’m Dying, and Breath, Eyes, Memory.